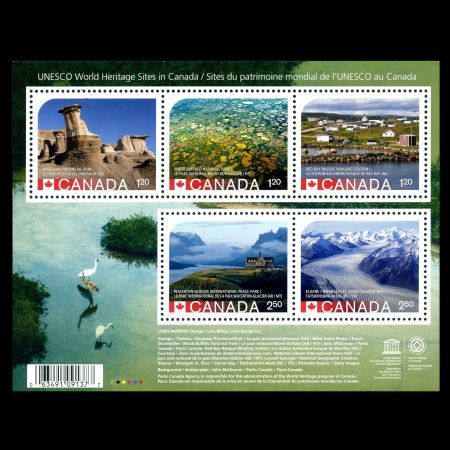 On July 3, 2015 Canada Post launched the third set of stamps of UNESCO World Heritage sites in Canada serie. 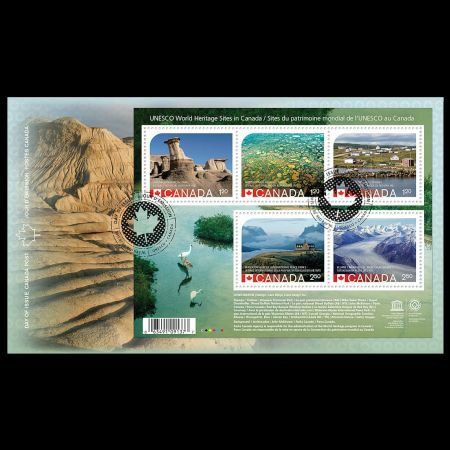 Canada has 17 UNESCO World Heritage, five of which are included in this first set. 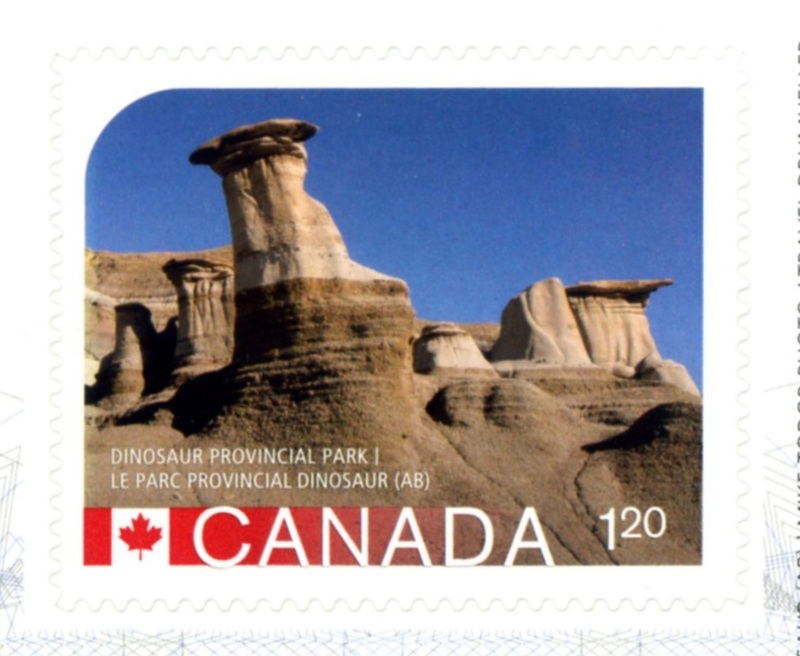 On July 7, Officials at Canada Post have issued a recall on a stamp featuring Dinosaur Provincial Park, a UNESCO World Heritage Site, because of a big problem. 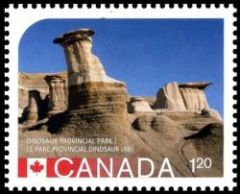 The error comes from the image used on the stamp, which is of a set of hoodoos, a rock formation found in the provincial park, located just north of Brooks, Alberta. 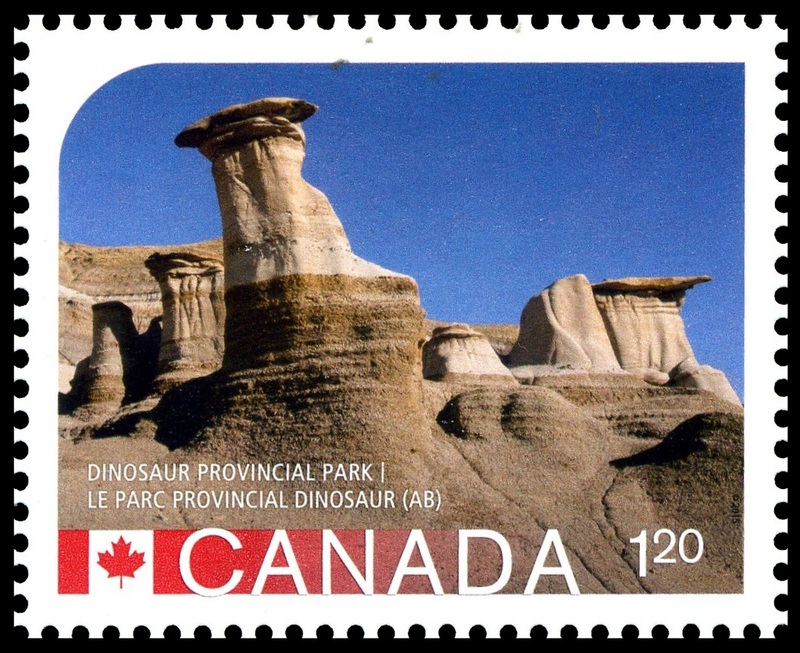 The problem is that the image on the stamp is actually of hoodoos that exist east of Drumheller, a community about an hour and a half northwest of Brooks. Canada Post has apologized for the error and is recalling the stamps from all post offices so they can be destroyed. A new stamp, with a correct picture, issued on August 21. 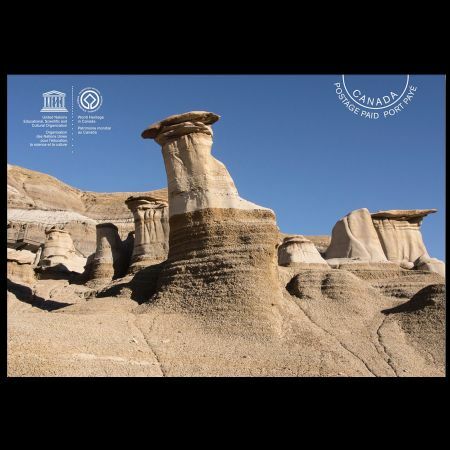 Hoodoos take millions of years to form and stand 5 to 7 meters tall. Each hoodoo is a sandstone pillar resting on a thick base of shale that is capped by a large stone. Hoodoos are very fragile and can erode completely if their capstone is dislodged (in other words, no climbing allowed). The name "Hoodoo" comes from the word "voodoo" and was given to these geological formations by the Europeans. In the Blackfoot and Cree traditions, however, the Hoodoos are believed to be petrified giants who come alive at night to hurl rocks at intruders. Drumheller is a town within the Red Deer River valley in the badlands of east-central Alberta, Canada. It is located 110 kilometres northeast of Calgary. The Drumheller portion of the Red Deer River valley, often referred to as Dinosaur Valley, has an approximate width of 2 kilometres and an approximate length of 28 kilometres. Post office in the city use permanent post mark with the slogan "Dinosaur Capital of The World" and image of Trex. The postmark launched on 09.10.2001 for the first time, then slightly changed in 2015. The new one is a bit bigger inside, has different text font, moreover the city name on the old postmark is "DRUMHELLER, ALBERTA", when on the one "DRUMHELLER AB"
Drumheller is also known to Paleontology funs, because of Royal Tyrrell Museum located only 6 kilometers away from the city. The museum is a Canadian tourist attraction and a centre of palaeontological research noted for its collection of more than 130,000 fossils. The museum is situated in the middle of the fossil-bearing strata of the Late Cretaceous Horseshoe Canyon Formation and holds numerous specimens from the Alberta badlands, Dinosaur Provincial Park and the Devil's Coulee Dinosaur Egg Site. The Museum is named in honour of Joseph Burr Tyrrell, a geologist who accidentally discovered the first reported dinosaur fossil in the Red Deer River valley in 1884 while searching for coal seams. The carnivorous dinosaur was later named Albertosaurus sarcophagus. The museum opened September 25, 1985 and was given "Royal" status in 1990.